Today I had a now-rare opportunity to visit my old life. A meeting on a high-up floor of a downtown law firm with views across the city. A conference table, a catered lunch, a laptop open in front of me, moving through bullet points on an agenda. I was there for a good cause, a volunteer gig for an organization I love, and with some right smart and good-hearted women, but still…I was glad to leave. I miss a some things about working (adult conversation! feeling competent! having a secretary! ), and I will be glad to do it again when the time is right. But today I just wanted to get home, snuggle my family, and make granola. The NY Times article that accompanied this recipe was the first I ever read about making granola with olive oil. The article is dated 2009 so, yeah, I’ve been meaning to try it for a while. 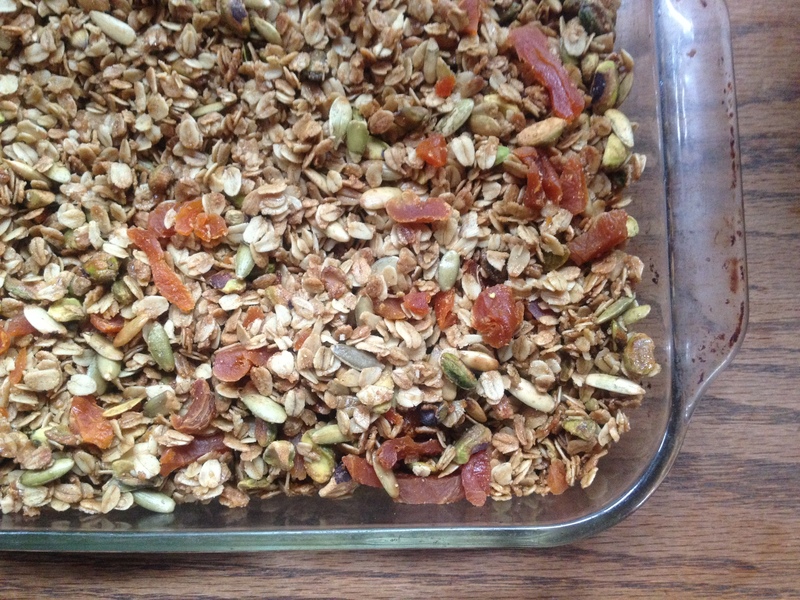 I made another olive oil granola recently that I loved, and this one was great as well. This is a sweet granola, and you can reduce the sugar a bit if you like, but I think it’s pretty great stirred into a bowl of yogurt as is. Olive Oil Granola with Pistachios and Dried Apricots: In a big bowl, mix 4 c. rolled oats with 1 1/2 c. shelled pistachios, 1 c. pepitas, 1 tsp. kosher salt, 1/2 tsp. cinnamon and 1 tsp. cardamom. In a separate bowl, combine 3/4 c. maple syrup, 1/2 c. brown sugar, and 1/2 c. olive oil. Whisk well to incorporate the brown sugar, then combine the wet and dry ingredients. Spread onto two rimmed baking sheets and bake at 350 in the top and bottom thirds of the oven. Every 10 minutes, stir the granola and switch the pans, until the granola is brown and toasty, about 45 minutes. Stir in chopped dried apricots and cool. This entry was posted in Baking, Breakfast, DIY, Feeding Kids and tagged baking, breakfast, brunch, children, cooking, DIY, family, food, homemade, kids, lifestyle, recipes, whole grain on March 15, 2012 by emmycooks. I love the combination of cardamom, cinnamon and pistachios. Yum. Also might be delicious with a touch of cloves especially in the festive season. I’m going to try this one. That’s a great idea! I bought freshly ground cloves the other day (I’m going through them like crazy because I keep making this bread: https://emmycooks.com/2012/02/25/quick-whole-wheat-spice-bread-with-brown-sugar-orange-zest-and-walnuts/). They are so unbelievably fragrant, I think any excuse to use them is a good one! I hope you enjoy it as much as I have! I think I will also be baking it again tomorrow for the many-ith time. I love it too! I need more excuses to use it. I think from reading your blog that we might be neighbors. Email me at emmycooks at gmail dot com and I’ll bring you some of the next batch! Oh, I’m just seeing this comment now, for some reason. That’s so sweet of you! I’d love to do a little swap sometime. Me too…and pistachios didn’t hurt. See, the thing is I can’t make granola because I keep snacking on it, and it’s deceptively dangerous. Wait, that’s WHY I make granola…oh, right. I do occasionally alternate and snack on carrot sticks instead. Occasionally. I remember that article too. Olive oil and kiss of kosher salt. Delicious. The combo that you have made with apricots and cardamom made me swoon! I can just imagine how good it would be on top of yogurt and drizzled with honey. I love that you remember the same article from 3 years ago. It was a striking idea, wasn’t it? And it’s not half bad in practice, either. This is a good one. If you try it, you’ll be hooked! And especially if you usually buy granola, this is so much better and cheaper. Yum! This would be wonderful in my granola cookies! Delicious! We eat it by the handful. The cardamom is subtle and the fruit is bold. Thanks Emmy.